Getting people to visit virtual communities and repositories and view what’s posted there is hard. Convincing them to answer questions and proactively submit best practices, lessons, and other content is even harder. This is reflected in the classic 90-9-1 rule, which suggests that 90 percent of participants in an online community or collaboration site will be passive, meaning they will read content but will not actively contribute. An additional 9 percent will respond to posts and edit existing content (such as in a wiki), but only 1 percent will actually create new content without prompting. The 90-9-1 rule was created for the public internet—but what about communities and collaboration platforms inside companies? I would expect the ratio of knowledge contributors to consumers to be higher in the relatively “safe” space behind the corporate firewall. The data from APQC’s Promoting KM and Making It Stick research proves out that theory. 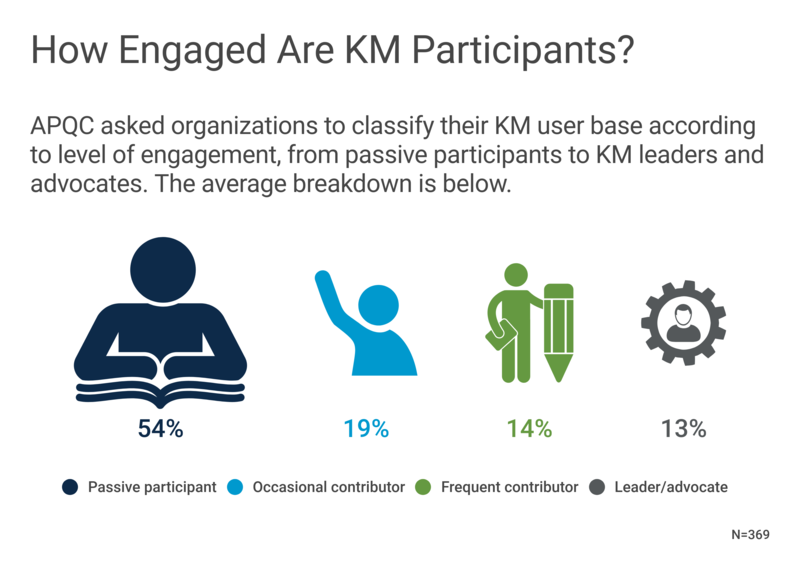 For the average organization, a majority of KM participants are passive, and an additional 19 percent contribute only occasionally. Things are not as dire as the 90-9-1 rule might imply. But nonetheless, a relatively small subsection of the user base (27 percent) supply the bulk of the knowledge—and by extension, the value—to KM tools and approaches. Obviously, KM teams could hugely expand the reach and impact of the communities and collaboration sites they support by nudging some passive and occasional participants to become frequent contributors, leaders, and advocates. But how? There are many ways to get employees more engaged in KM, but one I’d like to highlight is the Working Out Loud methodology pioneered by John Stepper, who will be speaking at APQC’s APQC’s upcoming KM Conference. I recently had the pleasure of interviewing John about what it means to “work out loud” and how KM teams might use his technique to increase collaboration and proactive knowledge sharing inside their organizations. The goal of Working Out Loud is to help people ease into collaboration and experience its benefits quickly and consistently so that, over time, it becomes a habit. The methodology focuses on forming “circles,” small groups of four or five people who meet for an hour a week over the course of 12 weeks. Stepper has developed guides for each week with exercises to help participants identify their personal collaboration goals, develop trusted relationships, and practice collaborative behaviors. Stepper’s advice to KM professionals interested in using Working Out Loud is to try it themselves. 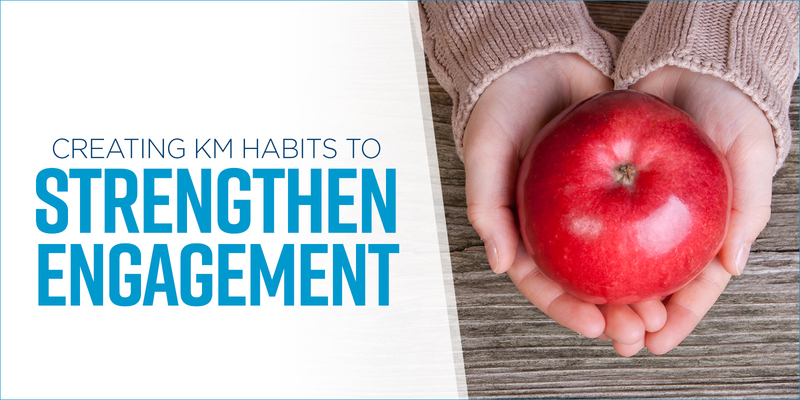 Form a circle inside the KM group or with other interested colleagues or contacts, test out the benefits, and scale from there. To get us started, he will be walking conference attendees through the process of setting up and participating in a circle during his keynote on May 2. Learn more and register for APQC’s 2019 KM Conference taking place April 29 – May 3 in Houston. Read more of my interview with John Stepper in Working Out Loud with John Stepper. Learn more about this research in APQC’s Promoting KM and Making It Stick research collection.